NASA will host a Facebook Live webcast today (June 1) with Facebook CEO Mark Zuckerberg calling the International Space Station. Facebook's Mark Zuckerberg wants to reach Alpha Centauri, but first he will settle for a call with astronauts on the International Space Station today (June 1), which NASA will stream in real time using Facebook Live. The founder and CEO of the world's largest social network will call the space station at 12:55 p.m. EDT (1655 GMT) to speak with NASA astronauts Tim Kopra and Jeff Williams, and British astronaut Tim Peake of the European Space Agency. 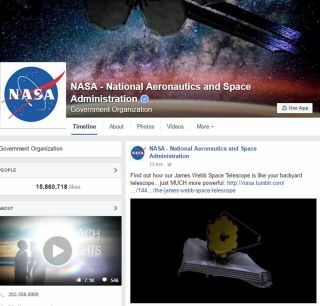 NASA will stream the cosmic conversation on its Facebook page here: http://www.facebook.com/nasa. "This in-flight downlink will allow the global Facebook community to learn about what it is like to live and work in a microgravity environment, how we use that environment to conduct out-of-this-world science, and explore how this program will help prepare to send humans on a journey to Mars," Facebook representatives said in a statement. Zuckerberg will spend about 20 minutes speaking with the space station astronauts, NASA officials said in an announcement. The public will be able to submit questions during the conversation, too, the officials added. Today's Facebook Live call with the space station crew comes about a month after Zuckerberg, physicist Stephen Hawking and Russian millionaire scientist Yuri Milner launched a project called Breakthrough Starshot. The $100 million project aims to build a prototype robotic spacecraft that would use light to sail to the Alpha Centauri star system (about 4 light-years away), reaching the destination in only 20 years. The technology for it is either available today or will be available shortly, the founders said, and would cost about as much as the largest scientific experiments. The spacecraft will be small and simple – just a wafer-size chip propelled by a very thin sail. After leaving Earth on a mothership, the spacecraft will aim for Alpha Centauri by riding a laser light beam aimed from Earth.